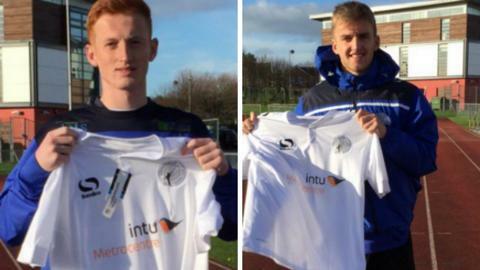 Gateshead have signed defender Liam Gibson on loan from Newcastle until 19 December and Sunderland midfielder Martin Smith until 2 January. Gibson, 18, has played for Newcastle's under-21 side but is yet to make the step up to the first team. Under-21 regular Smith, 20, is yet to make his first-team debut at Sunderland but has been an unused substitute. "Newcastle and Sunderland have been great in allowing us to take players on loan," boss Malcolm Crosby said. Gibson added: "The step up from under-21 football is massive, I just want to help the team get a few wins under their belt. "I've come in to play centre-half but I can also play left-back." The Tynesiders have already taken Sunderland midfielder George Honeyman on a loan basis - an influence on Smith's move. "It was a great opportunity for myself to work with the manager and the coaching staff," Smith told BBC Newcastle. "It was an opportunity to play men's football and play first-team games. I had a chat with George, he loves it here and it's helped him a lot. I didn't see any harm in coming here."